The wildfires that have been threatening Sierra Vista, Arizona created a epic pet emergency in addition to the human drama. Dr. Pam Drake and Hospital Administrator Kathryn Honda from New Frontier Animal Medical Center, threw open their doors as soon as the evacuations were announced. 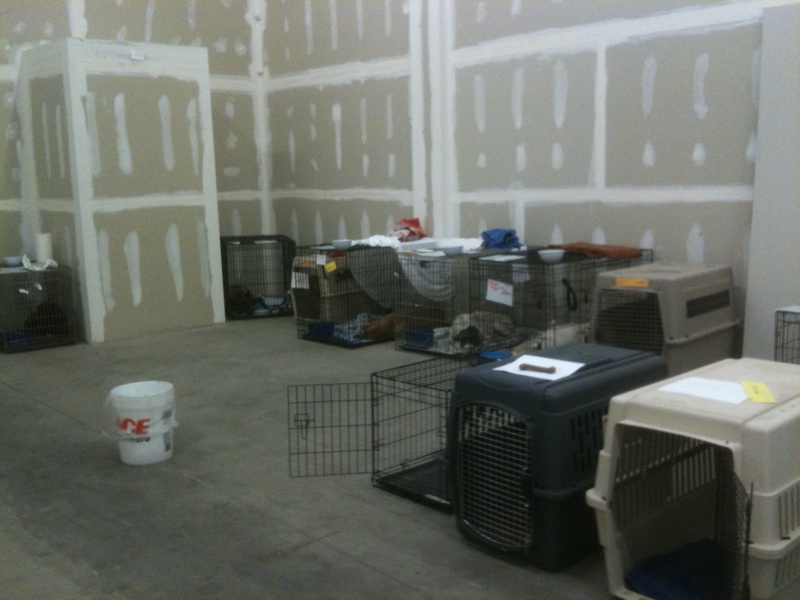 By the 17th, New Frontier was looking after 300 pets spread across three locations. Having run a practice in, and lived in, Sierra Vista and consider Kathryn and Dr. Drake friends, I felt that I needed to help if I could. 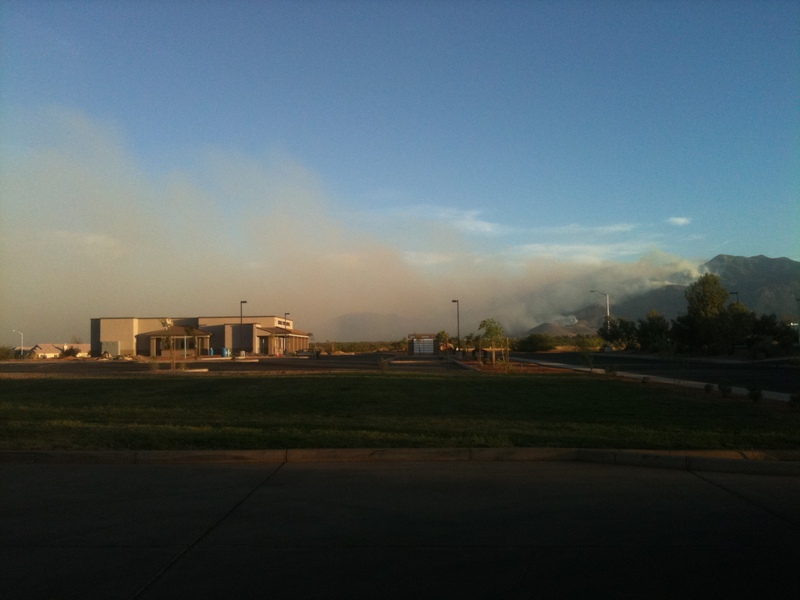 The view of the Monument Fire from the New Frontier parking lot. When I arrived at New Frontier on the morning of 18th the scene that greeted me was on of controlled and cheerful chaos. A loose dog, in the parking lot which I helped to retrieve from underneath a parked pickup truck, seemed to underline the whole morning. 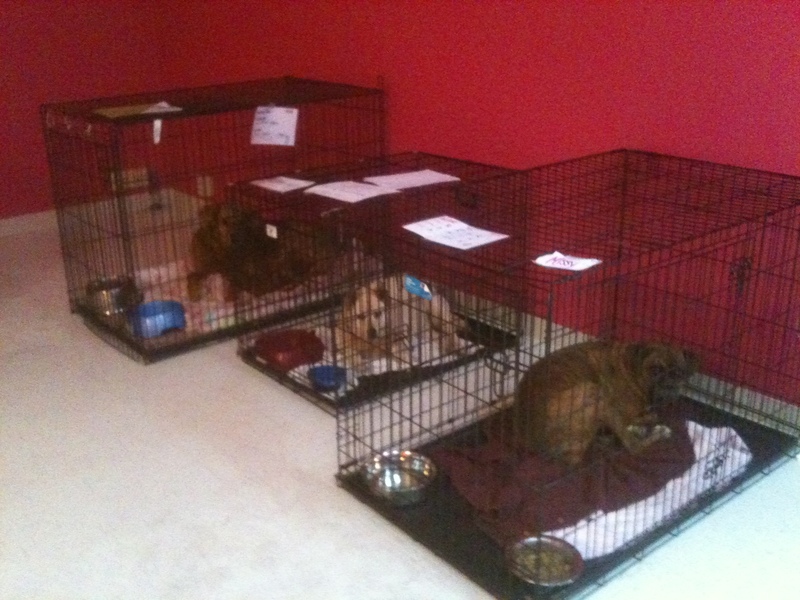 After touching base with Kathryn, and finding out how I could help, I headed for the main dog shelter – annex 2. New Frontier’s main building was acting as a triage center and treatment center for any pets that required significant medications. 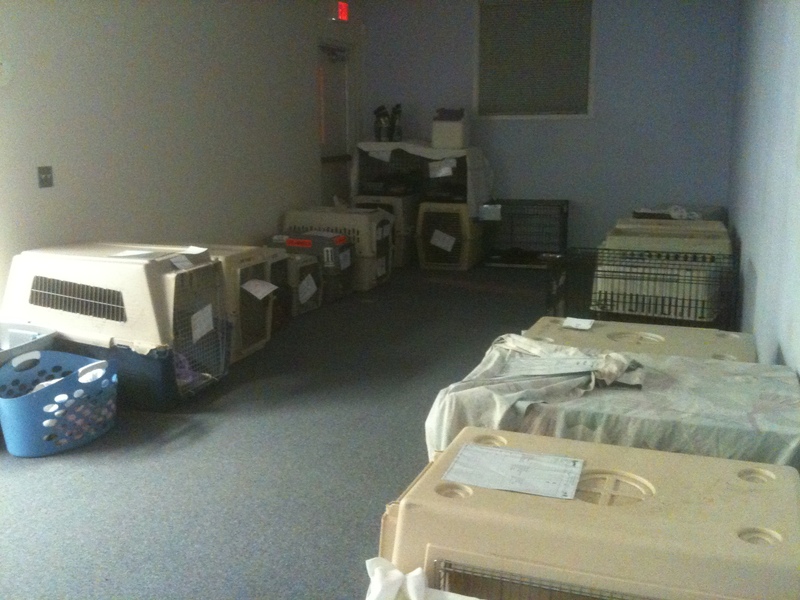 Annex 1, the main cat shelter was an empty office space in a strip mall. 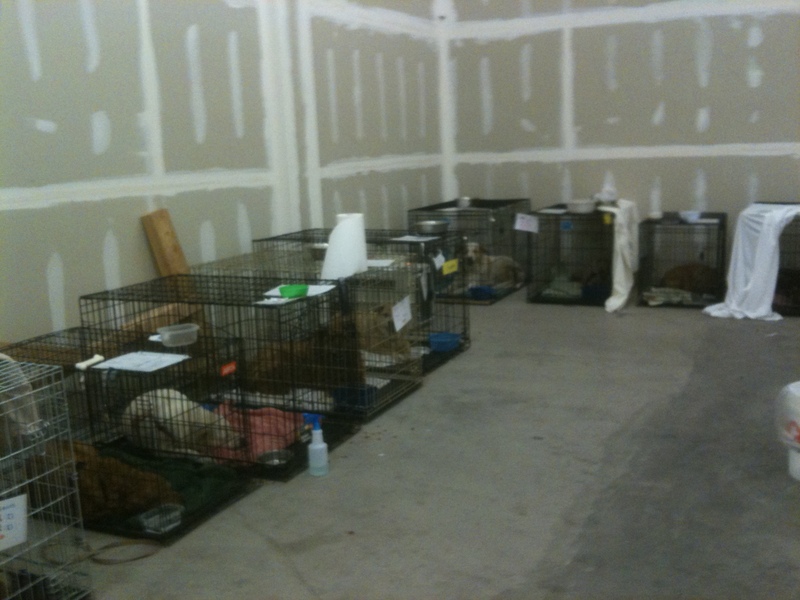 Annex 2, the main dog shelter, was behind the main Fedx depot in Sierra Vista. Both annexes had been generously donated by a local property management company. Annex Two – the carriers and cages had been donated by members of the public. 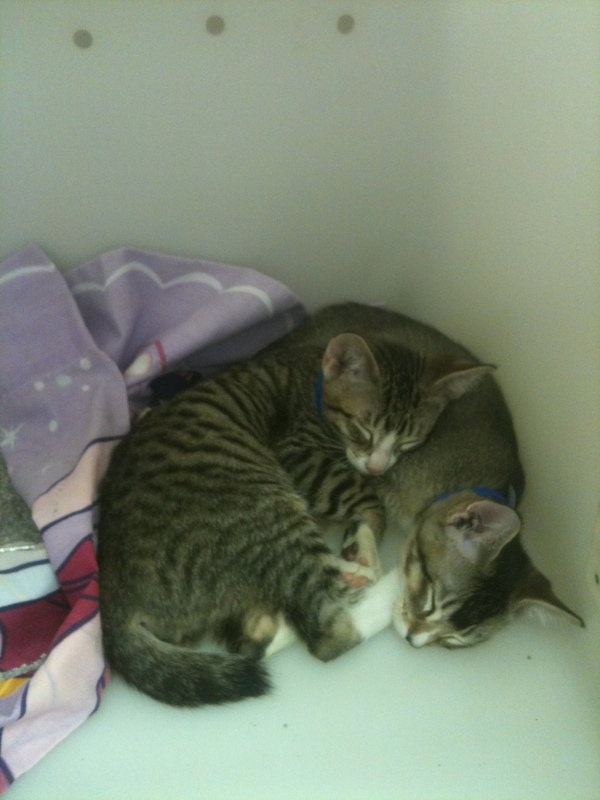 Although the staff of New Frontier had done a great job of documenting the influx of pets, the sheer volume, inexperienced volunteers and multiple locations had led to multiple lists of pets. My job, for the day it would turn out, was to inventory and create an single list in Excel that the staff could refer to and find pets for the owners and contact owners about their pets. With a population of that size just knowing how many we had and where they were seemed a minor problem until you tried to manage them as a pollution rather than as just an evacuation. After a 14 hour day, I headed home as the fire seemed to have quieted down and things were very much under control at New Frontier and the two annexes. Due to a previous engagement I spent the 19th in Tucson. In the afternoon, my phone started to go crazy. The wind had dramatically picked up, the fire had jumped the highway and was baring down on both the major boarding facilities that were also acting as shelters – one was evacuated that that day. New Frontier was on pre-evacuation and had taken the decision to evacuate all their evacuees to a third annex. Coronado Veterinary Hospital was evacuated for the second time. My Tucson colleagues who are part of the Southern Arizona Veterinary Managers Group (SAVMG) were already raising the alarm and getting staff and supplies on their way to Sierra Vista, along with my boss who reached out to vendors and other veterinary practices. So off I headed back to Sierra Vista. When I arrived, Annex three was already setup, annex one was completely full and annex two had become the central triage center. 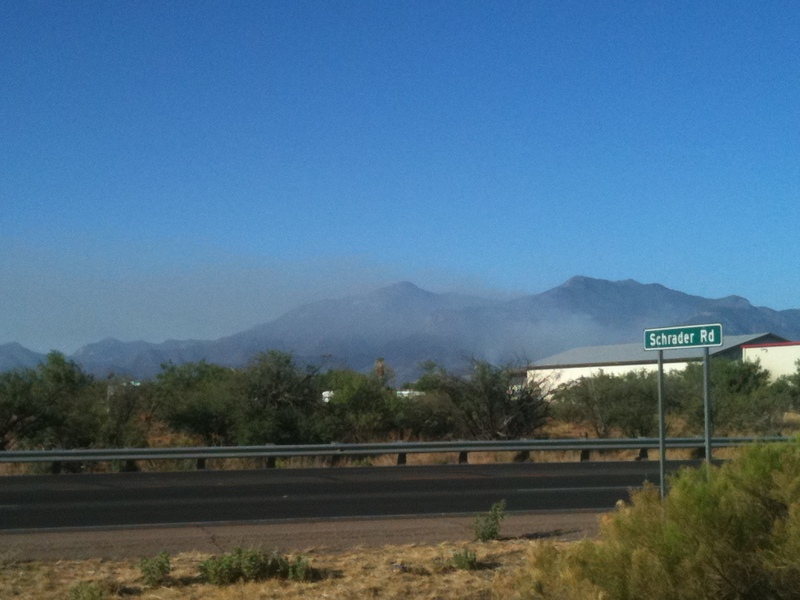 As night fell the mountains could be seen burning and smoke still covered Sierra Vista. I updated my spreadsheet, spoke to the media on behalf of New Frontier, and worked on a plan of action with Kathryn for the following day(s). I spent the night at Annex three as all the hotels for miles were full of evacuees. The biggest issue on Monday the 20th was management. Lots of new volunteers, who needed to be trained to handle both unfamiliar dogs and cats as well as how we needed to document. It was also unfortunate that we had a number of volunteers who were comfortable with dogs of whom we had 100, but we had a shortage of cat friendly volunteers and we had 200 cats. Luckily for us, Laurie Miller from AAHA as well as a number of technicians and doctors from Tucson were on hand throughout the morning. They worked tirelessly, and very much got into the spirit of having to make things up as we went along. It was definitely a balancing act between the standards we like to uphold as veterinary professionals – particularly when it came to documentation and at the same time making things easy and friendly enough for the volunteers who were going to be the day in and day out help that would keep the operation running. A scare in the morning of the 20th, brought up the specter of of parvovirus. Although the test was negative, a rush request was put into our SAVMG colleagues in Tucson to see if we could get 150 dose of Bordatella intranasal vaccine as kennel cough was potentially a bigger threat to our hastily thrown together population. As I left Sierra Vista for the second time it was interesting to reflect on the issues and problems that my weekend had brought up. The complete lack of infrastructure made communications extremely difficult, phones were a huge issue – I spent an incredible amount of time just driving between the various annexes. Facebook became a significant communications channel for both the pet rescuing community and the entire Sierra vista community at large. However, having spotty Internet access (iPhones and iPads) made access a chore with so much else going on. Considering that New Frontier went from 0 to 300 pets in a matter of a day or two they did a remarkable job, made even more extraordinary that Kathryn and several other staff were evacuated themselves. The entire community pulled together in a quite extraordinary way and the support from our Tucson veterinary community and distributors / manufactures made everything possible. As I write this much longer blog post than planned, the fires are seemingly under control (60% contained) and the Annexes are beginning to empty. Almost 60 homes have been destroyed and many more buildings damaged and one hopes that this is a once in a life time disaster. Hi there to all, it’s truly a good for me to go to see this web page, it contains helpful Information.